March Madness typically means basketball and brackets, but this year Words to Sweat by is holding a March Madness of its own in the hopes of helping fans get ready for continued fitness in Spring and Summer. I am therefore hosting a variety of giveaways and offering discounts on fan favorites (and more!) throughout the month of March. 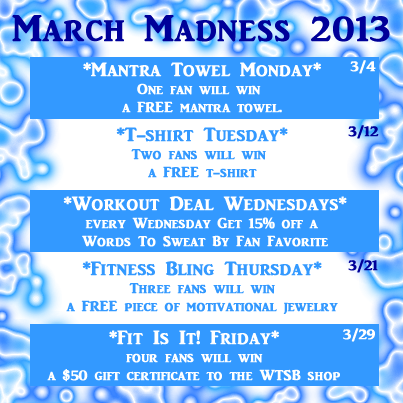 EVERY Wednesday throughout the month a 15 % discount will be offered on a fan favorite item! Thank you for your continued support of Words to Sweat by and good luck! My favorite fitness mantra is “Do it for those who can’t.” My mom had bladder cancer 2 years ago and we almost lost her twice and my dad had a defibrillator/pace maker implanted last year, so the are my motivation and inspiration to use my healthy body to the best of my ability. Previous post: Why Does The Queen Of Hearts Rule The Fitness Kingdom?